EXPLORING THE OCEAN BLUE: A WEBQUEST "Blue Planet" is the Earth's nickname because from space it looks like a giant blue marble! That's due to the blue coloring of the Earth's oceans which make up 71% of our planet. 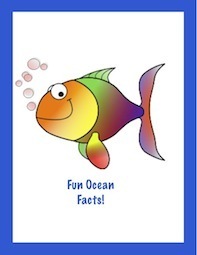 Learn more about the Oceans with this fun/informative webquest. 1. In 2012, film director, James Cameron went to the deepest point of Mariana Trench in a submersible called DeepSea Challenger to a depth of 35,787ft(from NG Magazine/June 2013) That's almost seven miles down! The only other manned expedition took place in 1960, when Don Walsh and Jacques Piccard went in a bathyscaphe into the Mariana Trench to a depth of 35,813 ft.
2. If you measure the tallest mountain from the sea floor up, Mt. Everest isn't the record holder! The highest mountain would be Mauna Kea, in Hawaii. It is 33,474 ft. from the ocean floor but only 13, 680 ft. above sea level. 3. The earth has an estimated 315,000 miles of coastlines. That's enough miles to go 12 times around the Equator! 4. The Ring of Fire located in the Pacific Ocean is the largest zone of active volcanoes on the sea floor. There are about 1133 of volcanoes! 5. The longest mountain range on Earth is found in the Atlantic Ocean, from Antarctica to Iceland!